Land cover change is usually a forgotten suffix to Land-Use, in LULCC (Land Use Land Cover Change) which refers to how the land cover changes when the land use alters. But the land cover can be different from climate changes too. Under climate change, the distribution of plant types alters as for instance a region warms, or the water availability decreases. Climate Induced Land Cover Change (CILCC) is projected using a dynamic vegetation model that determines what plant type is likely to grow in a given place. The Representative Concentration Pathways (RCPs) are a set of projections of future socio-economic scenarios that lead to varying levels of climate change by 2100, used in the latest IPCC report. They range from low levels of overall climate change (RCP2.6), mid-range (RCP4.5), to high (RCP8.5). The RCPs have different LULCC assocaited with them, which have been extensively assessed. By comparison, CILCC in the RCPs has been more or less ignored. We have a new paper in Global Biogeochemical Cycles that assesses whether we should be ignoring CILCC and focusing on LULCC. And just for fun, we’ve put some of the results into a quiz. Take our quick quiz to see what you know about how CILCC compares to LULCC in the RCPs. Q.1 Between 2005 and 2100 in RCP2.6, 4.5 and 8.5, is the area of land altered larger from LULCC or CILCC? Amount of global land cover changed from Land use, and from climate changes, in the RCPs. In all three RCP scenarios that we looked at, the area of land changed was larger from CILCC than from LULCC. This is despite LULCC having had considerably more attention in recent research than CILCC. Q.2 Of RCP2.6, 4.5 and 8.5, which has the largest net global loss of trees at 2100 compared to 2005? The loss of global forest in the RCPs, from Land Use Land Cover Change (LULCC), Climate Induced Land Cover Change (CILCC), and both together (Net forest change). The largest net loss of forest (including CILCC and LULCC) occurs in RCP2.6. Despite the LULCC in RCP8.5 being very similar to RCP2.6, the CILCC in the higher climate change scenario means that 90% of the deforestation in RCP8.5 is compensated by boreal forest expansion from CILCC. b. CILCC accounts for 14 – 22% of total terrestrial carbon changes over the coming century. LULCC accounts for 6 – 12%, and the accumulated carbon (not in areas of land cover change) accounts for the rest – up to 80% of the total carbon change. Although the climate effects of LULCC has been a popular research area in recent years, CILCC and terrestrial carbon accumulation are arguably more important to the climate. Q.4 How many of the CMIP5 models includes a) the terrestrial carbon cycle and b) how many of those include dynamic vegetation (to model CILCC)? Of the 39 CMIP5 models, only 18 include the terrestrial carbon cycle, and we only know of 3 that include dynamic vegetation (and are therefore capable of projecting CILCC). This is a major shortcoming from both a carbon and ecosystem perspective. 0/5 Well, never-mind. Perhaps ocean biogeochemistry – or like, knitting – is more your thing. 1/4 Good start. You may need more work on memorising awkward acronyms (an important skill for this field). 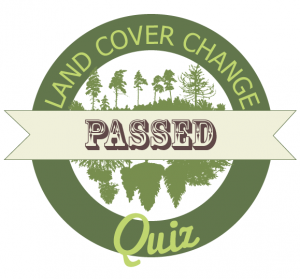 2/4 Half-way to knowing something about land cover change. A little more dedication and you will be arguing about whether secondary land use effects and land management are key uncertainties with the best of them. 3/4 Didn’t you do well? Perhaps you read the paper? Or are you just naturally talented? Well done either way. 5/5 Ah, you count both part a and b on Q4? Yeah, I totally agree. And if you got it all right then that is superb skills! 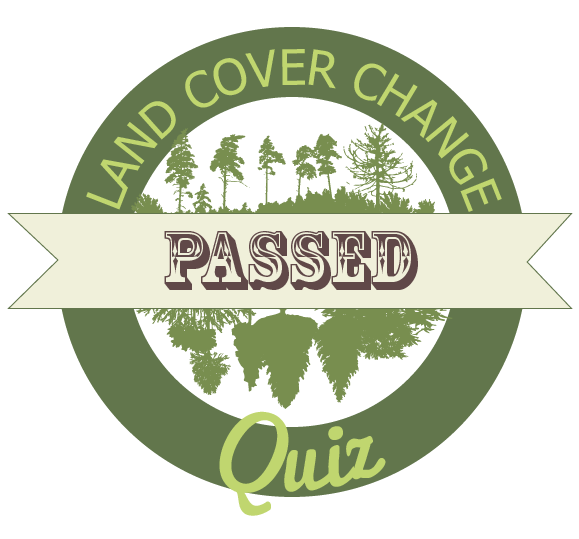 I did the Land Cover Change Quiz and PASSED. 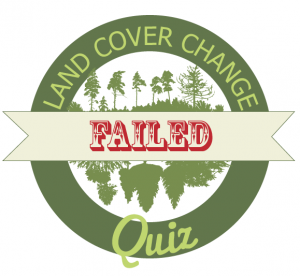 I did the Land Cover Change Quiz and FAILED.